Complaints by students against their universities have risen for a third year, the adjudicator has reported. 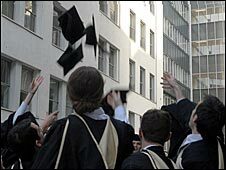 Almost two-thirds were about academic results, according to the Office of the Independent Adjudicator for Higher Education in England and Wales (OIA). And 64% of the complainants were mature students - aged over 25 - while more than a third were postgraduates. The OIA conference next week will call on universities to cater better for the new, older student population. The adjudicator, Ruth Deech, said the complainants reflected the changing makeup of the student body: more graduates and older students, more from non-traditional backgrounds, more with English as a second language, more with disabilities or with caring responsibilities. "You can't reduce conflict over grades. We don't interfere with academic judgements and I think it's important for British academic institutions to keep upholding their high standards," she told the BBC News website. But other areas of complaint might be reduced by adopting US or Australian-style campus ombudsmen, she said. "Somebody with an open door who can listen informally to students' concerns and who also has the capacity to access university authorities." She did not want a rise in complaints to her office - which takes up issues when universities' internal processes have failed. Part of the reason for the increase in friction was students' desire for "value for money" in a time of higher fees - sometimes backed by the parents who are paying them. This went hand in hand with the perception that employers would not consider them unless they had upper second or first class degrees. And increasingly the "litigation culture" was in evidence, Baroness Deech said. "There are also quite a few solicitors' firms around, backed by legal aid, who are only too ready to represent students," she said. "There are some firms we see a lot of. We keep saying you don't need a lawyer, to complain to us, and yet quite a few of them do have lawyers." In 2007 applications to the OIA rose by 25% compared with 2006, from 586 to 734. Six hundred of the complaints were deemed eligible for consideration of which 26% were upheld to some extent - up from 19% in 2006. The adjudicator recommended that a total of £173,000 in compensation should be paid to the complainants. The OIA was set up in 2004 to review student complaints from the 146 universities in England and Wales.